The picture above is a picture of one of my shelves of cookbooks. You can see quite a few of my cookbooks in that picture, but today we are going to talk about those four grilling cookbooks. They are some of my favorite cookbooks to turn to when I need dinner ideas and inspiration this time of year. Summer and warmer weather is here and for the next few months that means it is time to grill and I am always looking for new recipes for grilling and bbq. In Oklahoma we actually grill most of the year, but during the summer we definitely grill a lot more. In our house we often grill several times a week. I thought some of you might also be looking for new grilling ideas, so I thought I would highlight a few of my favorite grilling cookbooks. These are great for someone that just bought a grill and also for anyone that has been grilling for years. These books really work for anyone looking for new grilling recipes and ideas. 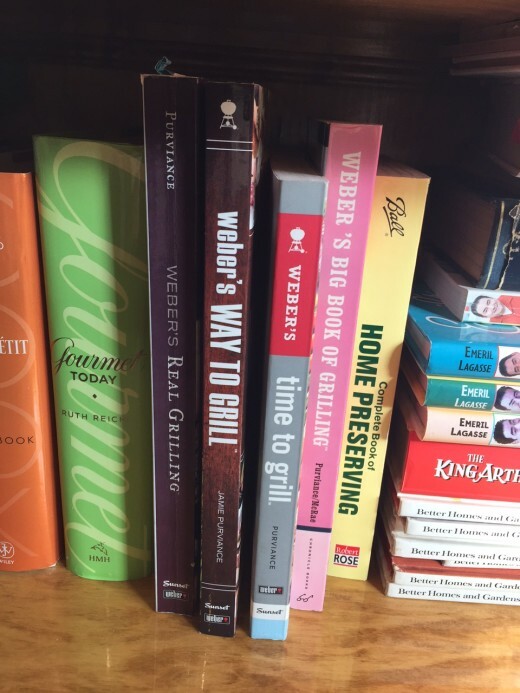 Quite a few years ago my sister told be about one of Weber’s Grilling cookbooks called Weber’s Real Grilling: Over 200 Original Recipes . She loved and highly recommended that I buy the cookbook. My sister is a lot like me and loves to cook, so I knew if she loved the cookbook I probably would too. The cookbook did not disappoint. I loved it. In fact, I have loved and used the cookbook so much that it is falling apart. That exact cookbook is no longer being printed. You can buy it used, but they have a new version called, Weber’s New Real Grilling: The ultimate cookbook for every backyard griller . The new version is on my cookbook wish list. It looks like a great cookbook and from what I can tell is full of different recipes than the old one had. I also own Weber’s Time to Grill: Get In. Get Out. Get Grilling. and Weber’s Way to Grill: The Step-by-Step Guide to Expert Grilling. I love them both. They contain so many great ideas. I also have Weber’s Big Book of Grilling that I love. It is also not available new, but you can find used copies. Since I am always looking for new grilling ideas, on my summer cookbook wishlist is the Weber’s Big Book of Burgers: The Ultimate Guide to Grilling Backyard Classics and Weber’s Charcoal Grilling: The Art of Cooking with Live Fire . They both look great and since I don’t have them I would love to add them to my collection. As you can tell I am a big fan of turning to the experts when it comes to bbq and grilling cookbooks and Weber is one of the best. They know their grills and they know grilling. And you don’t have to have a Weber grill to use these books. Any grill will work fine, but Weber knows how to make great marinades, burgers, pork, grilled vegetables and more so they make a great source for recipes. If you are wanting some inspiration for your summer grilling and bbq’s check out Weber’s cookbooks. I think you will love them. What is your favorite source for grilling recipes and ideas? Disclaimer: This post contains Amazon affiliate links, but it is not sponsored by Weber. I just love Weber cookbooks and wanted to share them with you.